David Kahne was born on September 10, 1923, in Monte Vista, Colorado. He enlisted in the U.S. Army Reserve on June 5, 1942, and entered the Aviation Cadet Program of the U.S. Army Air Forces on February 18, 1943. He graduated with a commission as a 2d Lt and was awarded his pilot wings on March 12, 1944, and then completed B-17 Flying Fortress transition training before deploying to England with the 748th Bomb Squadron of the 457th Bomb Group in September 1944. Lt Kahne flew 35 combat missions before returning to the U.S. in April 1945. After completing advanced instructor flying training, he was discharged from active duty on October 15, 1945, serving in the Air Force Reserve until being recalled to active duty on April 2, 1951. After serving at Mather AFB, California, Capt Kahne served in West Germany from January 1952 to April 1955. He then completed B-29 Superfortress transition training, KC-97 Stratotanker transition training, and KC-97 aerial refueling training before serving as a KC-97 pilot from December 1955 to December 1957. Capt Kahne next completed Flight Instructor Upgrade Training at Vance AFB, Oklahoma, before serving as a flight instructor with the 3576th Pilot Training Squadron and the 3575th Pilot Training Group at Vance AFB from January 1958 to September 1961. He received an Air Force Institute of Technology assignment to the University of Wyoming in September 1961, and completed his bachelor's degree in industrial engineering in September 1963. Maj Kahne then served as a Research and Development Officer for guided missile testing at Holloman AFB, New Mexico, from September 1963 to February 1966, followed by C-130 Hercules transition training. His next assignment was as a C-130 Hercules pilot with the 774th Tactical Airlift Squadron at Mactan Isle Airfield in the Philippines from September 1966 to October 1967, during which time he flew 659 combat support sorties in Southeast Asia during the Vietnam War. Col Kahne's final assignment was as Assistant Director of the Command Secretariat in the Office of the Chief of Staff for Headquarters Air Force Systems Command at Andrews AFB, Maryland, from November 1967 until his retirement from the Air Force on July 1, 1971. After retiring from the Air Force, he worked for the Bank of Laramie in Laramie, Wyoming, and then worked as a realtor until retiring in 1995. David married Shirley Lee on July 24, 1945, and they had three children together; Karin, David, and Steven. David Kahne died on July 19, 2010. 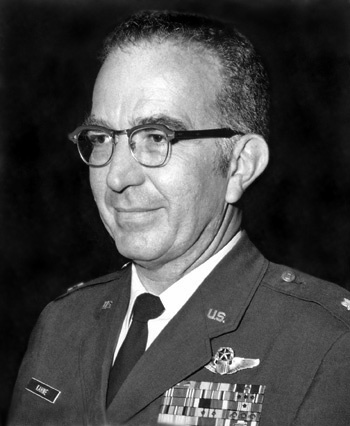 Lieutenant Colonel David S. Kahne distinguished himself by outstanding service to the United States as Assistant Director, Command Secretariat, Office of the Chief of Staff, Headquarters Air Force Systems Command from 9 November 1967 to 30 June 1971. In this important assignment, Colonel Kahne displayed a dedication to duty that surpassed all standards of performance previously identified with the position. In supervising all aspects of conferences held by the AFSC Commander with his Board of Visitors, his subordinate element commanders and the commanders of other major Air Force organizations, Colonel Kahne employed his management skills in unique and imaginative ways, thereby contributing materially to the efficiency and effectiveness of the conferences. The singularly distinctive accomplishments of Colonel Kahne culminate a distinguished career in the service of his country and reflect great credit upon himself and the United States Air Force.